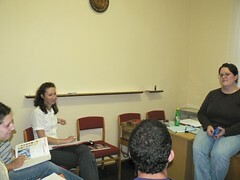 Above: Monday ESL classes are a perfect opportunity to build relationships with the community. 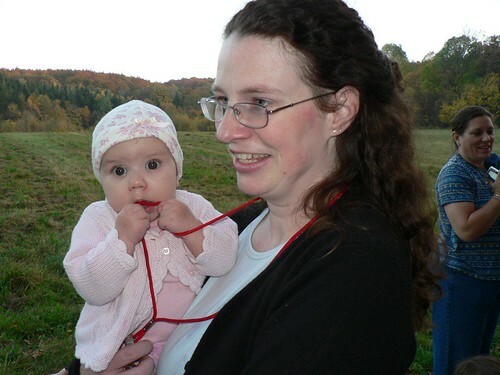 Above L: Heidi speaking with Orsi, who lives in the neighboring town of Selyp. 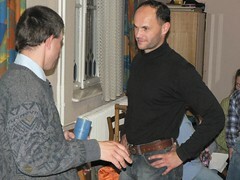 Above R: Csaba in conversation with Feri. We continue to hope that Feri will visit our church and connect with other Christians in the community. Please pray that he would come to understand the blessing of a local fellowship. Above: Brenda teaching the phrase, "saved by the bell" as someone's cell phone rings just in time for them to escape answering a grammar question. Above: Heidi's class with Hugi sitting directly in the middle. Hugi was one of the students that stayed after for our Bible study and actively participated. Afterwards, I invited her to church and she said that she would try to come this Sunday with her husband. Hugi has had a rough background full of rejection. Please pray that she would find a new life in Jesus as a child of God. 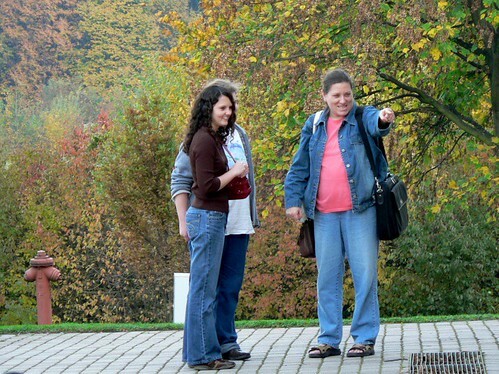 Above: Brenda's students Eszter and Monika that live in the town of Jóbágyi (10 minute drive). 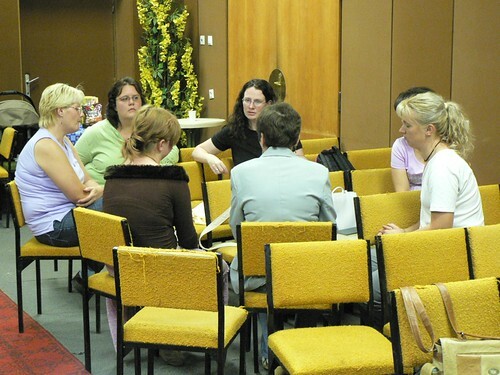 Eszter and Monika have consistently attended our second hour of Bible study. Brenda has agreed to meet with Monika outside of class to help with business english. Please pray for Brenda to be able to connect as a friend and also be able to share the gospel with Monika this Thursday. 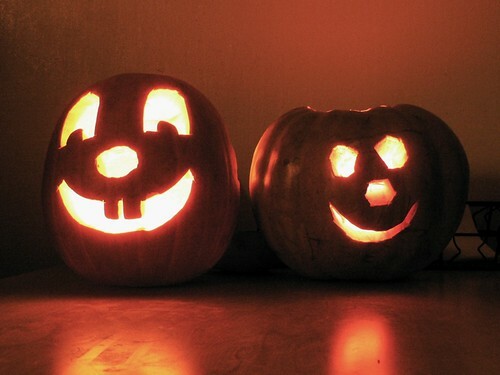 Above: No, we don't celebrate Halloween, but we do like choppin' up pumkins. Can you tell which one Ben designed and which one Allen designed? 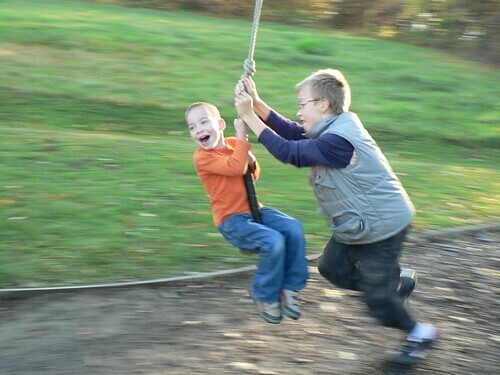 Above: With a little help from Austin, Ben picks up speed and burst into laughter at the retreat playground. Above: We praise God for a wonderful three days in fellowship with fellow Pioneers team members. Pioneers Hungary as a whole is going through many changes in structure as we seek to best use our giftings and adapt to our team's growth. This is both a streching and exciting time in the life of our team. 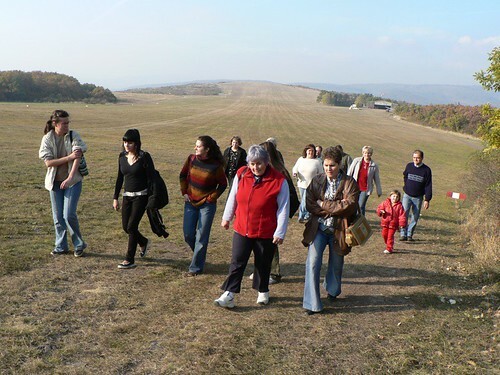 Above: A partial showing of Pioneers Hungary members. Some (not pictured obviously) remain on furlough, and others are awaiting support before full time commitment. 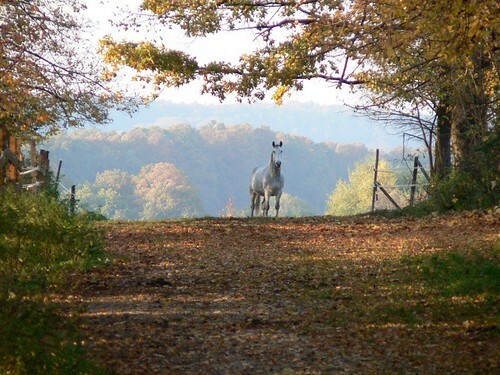 Above: This is such a beautiful time of year, and the beauty was multiplied at the retreat center's connected horse ranch. 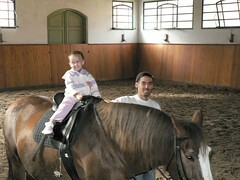 Ben and Elianna had a great time riding 15 year old "László". Above: Although you wouldn't be able to tell from this picture, 'glowing' Sharon and the kids remain quite sick. We are thankful that God calmed their coughing, allowing them to sleep through each night. After holding a worship service as a team at the retreat center, we were quick to eat lunch and hit-the-road to return to our worship service in PetÅ‘fibánya. It was a good feeling to walk in the door and be greeted by Miki, DezsÅ‘ and Csaba. I had a renewed sense of thankfulness for them and the work God is accomplishing in and through them. Above: Ben and Anna dragging Niki into 'jail' after service. Regina (DezsÅ‘'s oldest daughter) brought Niki to service tonight. Although they didn't stay to hear the preaching, I am thankful that they are very slowly approaching an encounter with God's truth. I am thankful that they feel welcomed to our church, though they cover themselves in black, have pierced lips and so on...we welcome them! We want them to hear the life changing message of the Gospel and come to the supreme Physician for complete healing. Our teammate Heidi has been able to build a relationship with Niki and Regina. Please pray for Heidi as she seeks love them and lead them to Jesus Christ. 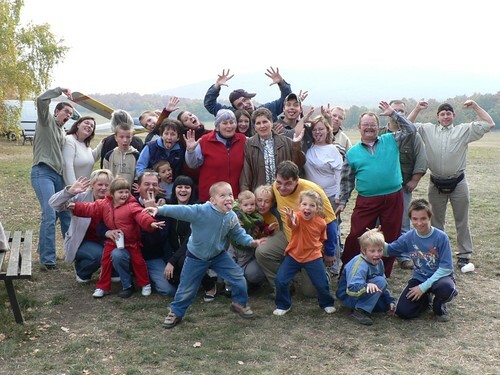 Pioneers team members in Hungary have come together this week for a few days of fellowship in Christ, strategy planning and of course fun. We have traveled to a beautiful location in Western Hungary where will spend the next three days together. 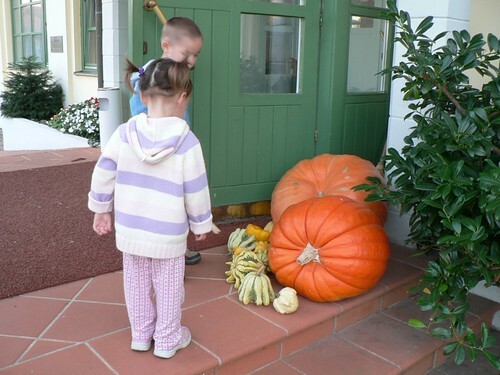 Above: Cathy tracking Benjamin as he mischievously approaches the pumkins. Above L: No, that is not Allen sitting at the table. That's Allen's 'twin' brother Roger, who is currently focusing on language study in Budapest. Above R: Ben looking through all the possible letters to use in his next word. 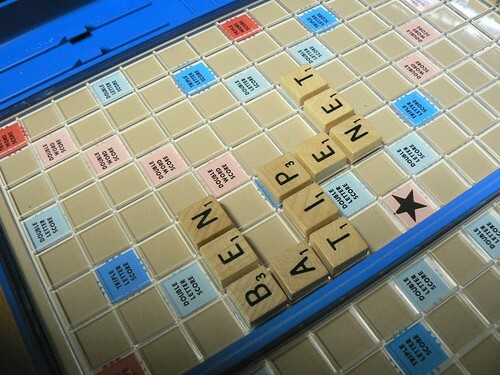 Above: Some of the words Ben spelled successfully. Above: Yesterday, Gabi and Zoli helped us prepare the facilities for our time together today. Above: After the traditional breakfast of rolls, butter and salami, we gathered together for our worship service. Above: Julika and her daughter Moni helped out today by holding Sunday school for the kids. Andi and Feri (above center) were permitted by their parents to spend the day with us. Andi took me by surprise today when she approached me by our book table. She asked, "Is it ok if I buy a Bible." I would have gladly given it to her for free, but we believe their is honor in purchasing the Bible (we offer them at cost). Please pray that God would begin to take her on a life-long journey through His living word. Pray that she may know God deeply through His word. Above: We were thankful for Peti's message on the importance of fellowship with God. He highlighted that this fellowship is the foundation of all obedience that pleases God. He warned of the danger of simply commanding God in prayer, and not asking within the context of a relationship in which we are submitted to His will. He raised the question, "Are we constraining God according to our expectations, or allowing Him to speak to us according to His will?" DezsÅ‘ told me after the preaching, "I was convicted today that it is good to wait for things in prayer. It is good to trust in God for an answer. Waiting is good for our faith." Above: After worship service, we spent some time playing family games together. Our desire today was for the members to get to know each other deeper than surface level. God opened up opportunity throughout the day for one-on-one conversations and joyful interaction. 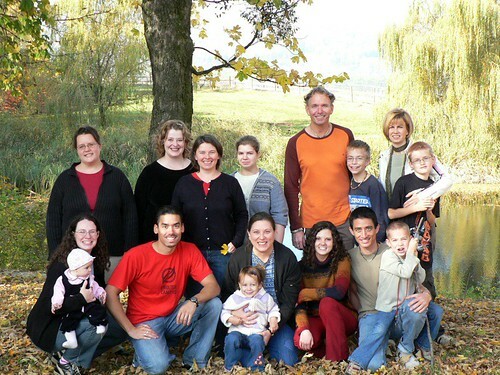 Above: We were thankful for DezsÅ‘'s oldest daughter Regina attending our retreat. Regina currently attends school in Budapest and our teammate Heidi has developed a friendship with her. Regina said that she enjoyed spending the day with us and was more open about God in conversation. Please pray for Regina who has seen both the lives of Christians and those of the world in contrast. She has also seen her father transformed, knowing him before and after his conversion. Pray that she may be drawn to His light, and come to know Him as her personal Savior and Lord. Above: The bout of the century. 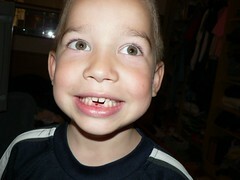 Benjamin and Kira go at it to see who will get their bottom two teeth fully grown first. 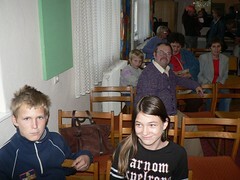 On Wedenesday, our hungarian partners in ministry Janka and Csaba visited the orphanage in Selyp/LÅ‘rinci. Csaba is seeking to have more one-on-one time with the teens who are often ridiculed if they are honest about their feelings in a group setting. One of the boys that Csaba met with told him private that he does believe in God. We hope his recognition of God may lead to an understanding of God's gift in His Son Jesus. 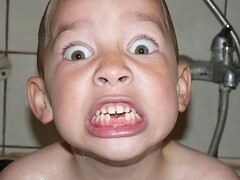 Many of these kids struggle with learning disabilities and problems paying attention. 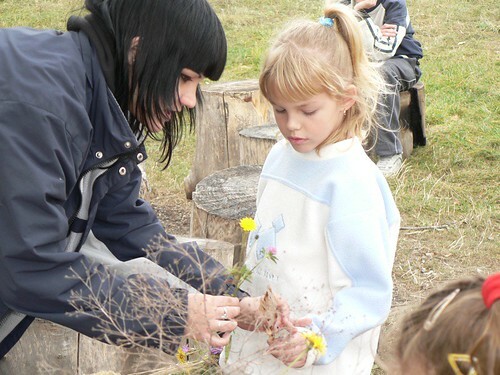 Janka teaches a class of kids ranging from pre-school to 7 year olds. She praises God for their ability to pay attention in her last two classes. On Thursday, we continue to hold two Bible studies. Miki's small group is focused on those who are still seeking or have recently made decisions to put their faith in Jesus. Allen's study is for building up those teens who have already made decisions to believe in Jesus. Ildiko (teenager Zoli's mother), Attila and Márcsi (DezsÅ‘'s wife) attended Miki's small group. Ildiko continues to show signs of understanding the gospel, yet continues to struggle with foundational truths. Currently she see's no need to attend church (however the small group is serving to bridge that) and is 'afraid' to read the Bible. None of know the root of this fear, but we do know the one using this fear to keep her from growing. Ildiko has a history of being in the occult, and her background may attribute to her current fears. We hope that you will pray for Ildiko to be drawn to God's gift of His truth revealed in His word. The enemy has used fear as one of his main tactics in this town. Pray with us that his tactics would fail, and that God would prevail in the lives of those who are turning to Him. On Friday, we held our teen outreach where we play indoor soccer and share a devotional at break time. I was thankful for teenager Gabi S. who helped me translate the devotion for the night via email. 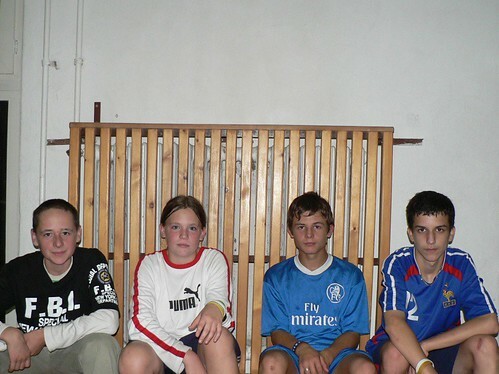 Above: Friday's sport outreach where we continue to develop relationships with teens from PetÅ‘fibánya. 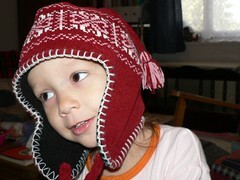 Above: Elianna having fun getting ready for winter. Above: Kira's favorite form of transportation. Above: Benjamin and Dad bringing out the giggles in Kira. 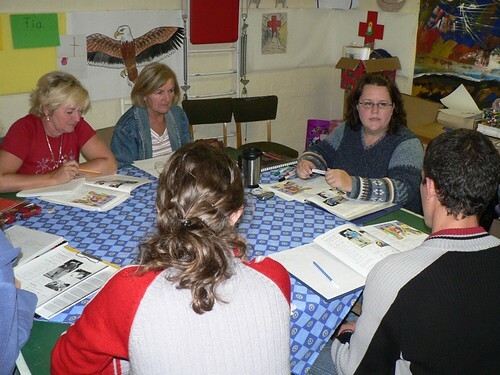 Above: Brenda's intermediate ESL class. Going around the table from front to back: Andi, Dávid, Eszter, Monika, Vali and Orsi. We thank God that all of Brenda's students (except for Vali) stayed after for our second hour of Bible study. 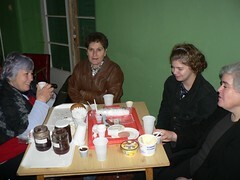 Above L to R: Heidi's students, Miki, Feri, Kati, and Jutka. Feri also stayed after for our study. 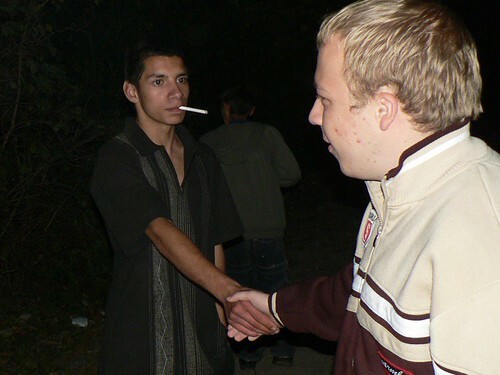 He told Miki that he is planning on coming to our Sunday Church retreat with his family. This will be a great opportunity to continue to get to know them, and them to know us. 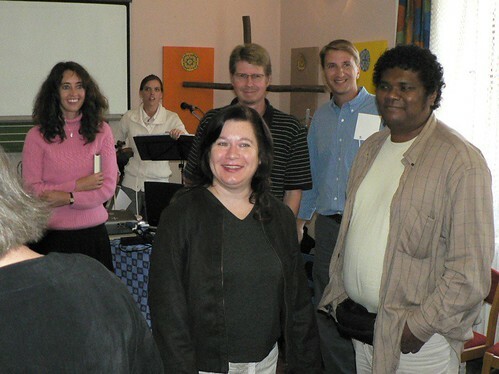 Above: My students Heidi and Szandi (turtleneck) also stayed after for the Bible study this week. 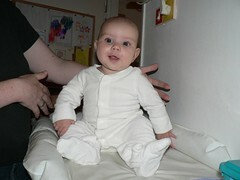 Heidi was very active in our discussion about Jesus' conversation with Nicodemus. I was grateful to God for His power over the enemy tonight. In contrast to last week, I sensed that people 'got it'. When we talked about new birth, I perceived that they understood. When we talked about the problem of our sinful hearts and the need for Jesus to give us a new life, the students 'got it'. Teenager Gabi S. did a great job translating for me tonight. Please pray for these students tonight. I gave them a short commentary on John 3 and a presentation of the gospel on paper for them to read at home. Pray that God would give them understanding of their need for Him, and that His Word would cut deeply into their hearts to bring conviction, repentance and faith in Jesus. 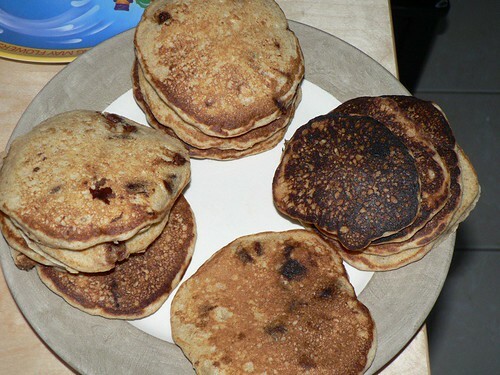 Above: Sharon's famous pancakes and Elianna playing peekaboo Sunday morning. 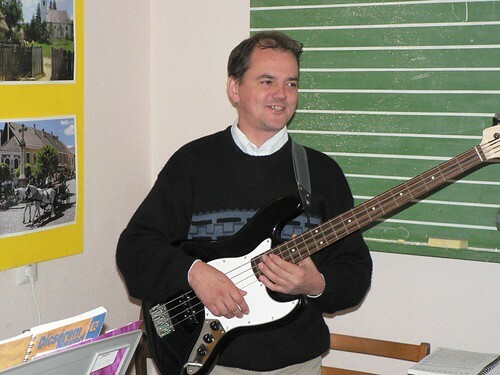 Above: With the help of donations from our team and from the church, we were able to purchase a bass guitar for DezsÅ‘. 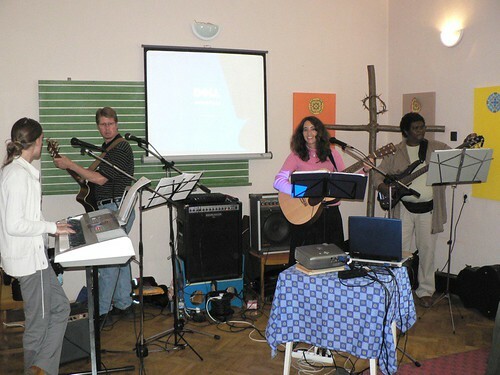 Up until this point, DezsÅ‘ had been using a borrowed guitar which we had to give back a few weeks ago. DezsÅ‘ continues to grow in his faith and we continue mentoring him in leadership. Miki and I met with DezsÅ‘ this morning and talked for hours about practical issues in our faith and in theology. 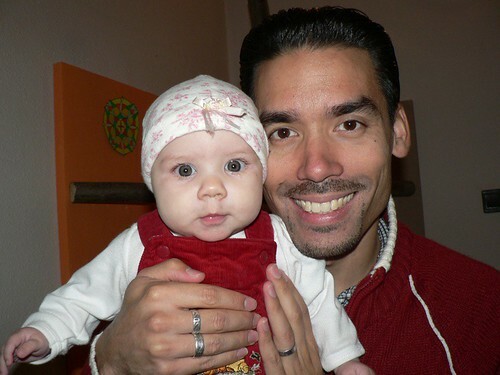 Please pray for DezsÅ‘ and his family, that they would continue to be strengthened in Christ and protected from the enemy. Above L: Feri and Andi continue to come to our wednesday worship practice and perform choreographed mime to some of our worship songs. 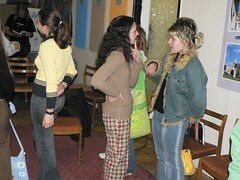 Above R: Lidia, boyfriend Norbi talking to Miki. 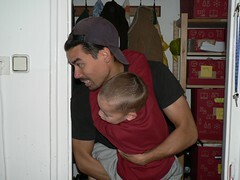 Above: Benjamin and Elianna taking Gabi S. hostage at church. Szilvi, standing next to Sharon, happened to walk into our Family Day outreach a few weeks ago. She has been attending our church ever since. Above: Janka, our children's Sunday School co-ordinator blessing our kids with the truth of God's word while Ben tests the elasticity of his face. 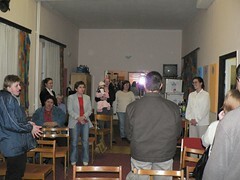 Above L: Csaba giving testimony to the power of prayer. 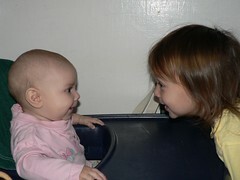 Above R: Singing happy birthday to Janka-I won't tell you how old she is. 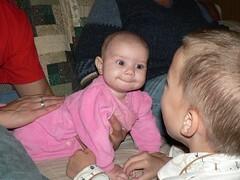 Above: Allen greeting one of our most faithful and youngest members of our church-Kira. Above top: Gabi greeting friends at the orphanage. Above R: Csaba getting the kids ready for game time. Thursday night, we had an opportunity to continue building relationships at an orphanage in the neighboring town of Selyp. It is our desire to visit them once a month and sharing the gospel and connecting these teens with our church. Teenagers Zoli and Gabi S. from our church joined us once again tonight to minister to these kids. We began the night with 'breaking the ice' by playing a game of Activity. 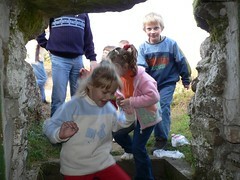 Slowly, one by one, the kids began to participate. Soon, the whole room was full of smiles and both teachers and kids joined in. Heidi helped us transition into our drama. She made the connection of our limited representations of the real object we were attempting to draw, and our often limited portrayal of God. 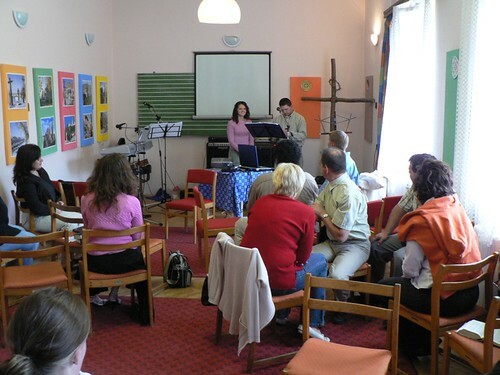 Miki and Janka prepared a drama which portrays the many perceptions of God. At the end of the drama, Miki dramatized Jesus, His death on the cross, resurrection and invitation for people to receive Him. 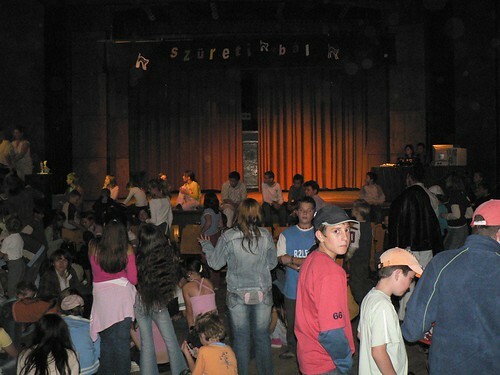 Above: Miki and Janka's drama performance. Erika followed up the drama with pointed questions. She asked, "If you were to appear before God, what one question would you ask Him?" Afterwards, we heard answers like: "Why did my mother die? Why am I always sick? Why are there parents that leave their kids? Why am I here?" The painful backgrounds of these kids is evident in their position in life and their questions. We pray that they will one day receive God's grace making them God's children through Jesus Christ. Above: Before we left, Sanyi wanted to share some of his Gypsy music. Later we persuaded him to show us Gypsy dance. I was able to learn a few moves-it's a bit difficult-but was lot's of fun. Above: On friday night we had some 'competition' for the teens participation. There was a village supported party celebrating the founding of PetÅ‘fibánya going on the same time as our sports outreach. I was able to pay a quick visit and take some pics. I met some of the teens who have 'drifted away' and was able to talk to them a bit. Afterwards, I left to open the doors for our sports outreach, wondering if anyone would show up. Above: I was encouraged to see many of the teens choose the sports outreach over the party. We also had 4 new 'first timers' who joined us. At break time, I encouraged the kids to think about their eternal destiny, and about the free gift of God's grace offered through Jesus Christ. I am sad to say that the enemy was hard at work to distract the kids just as I got to explaining Jesus Christ's amazing work on the cross. Up until that point, all the kids payed close attention. Just as I got to the heart of the gospel, a kid came late to one of the windows. Three teens ran to the window to greet him. Then one ran out to open the locked door for him. By that time, it was very difficult to get them settled to hear the gospel. Please pray that the enemy would not be successful in snatching God's word away from the hearts of these teens. Please pray that they would gain understanding, and conviction of their sin. Pray that they would come to know the only solution to sin and death-putting their trust in Jesus Christ alone. I will be inviting these teens to church on Sunday. Please pray that God would work in their hearts to respond to the invite. Part of my message contains a gospel presentation and an invite to believe in Jesus Christ. Above: Make room for Kira. Ben and Eli give up some bathtub real-estate for their favorite baby sister. 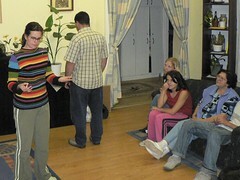 Tonight we held our ESL classes in PetÅ‘fibánya. We are thankful for being able to build relationships with the community through this class. 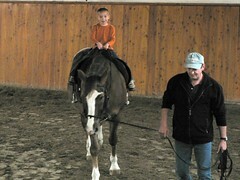 These classes cut through all age groups, and are a great way to interact with people from many different backgrounds. 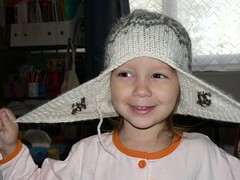 Above: Heidi having fun with Norbi (baseball cap) and Lidia in class. Both Lidia and Norbi attend our church and are welcome company in our second hour of English Bible study. 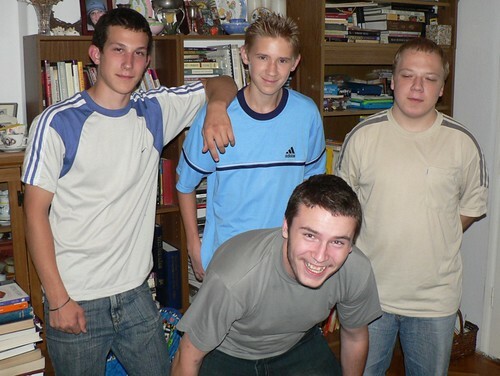 Above L to R: Kati, Feri, Csaba and Miki. It is great to have Csaba and Miki in the same class as Feri. Feri stayed after for our second hour of Bible study and even stayed through clean up time. I talked to him about his family history, and found out that his father moved to PetÅ‘fibánya to work in the mines (now closed). Feri also grew up in PetÅ‘fibánya. He told me how atheism was passed on since childhood, and how religion was frowned upon. 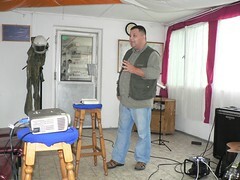 He shared how he met some Christians many years ago while serving in the military, and was saved. He told me that his friend who was also serving in the military, in a completely different area of Hungary, was saved at the same time by God's grace. Praise God! We invited Feri to an upcoming church retreat, and he is considering attending. Please pray that we would be able to build Feri up in his faith and that he would see the importance and blessing of being a part of a local church. As we transitioned from hour one to hour two of optional Bible study, DezsÅ‘ was approached by my student EnikÅ‘. She said to him, "So, what's this all about?" 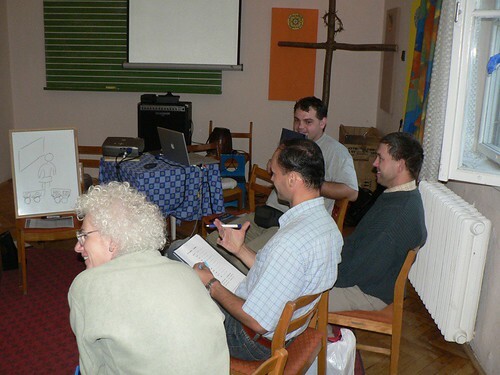 This gave DezsÅ‘ an opportunity to openly share how God transformed his life and how this study is about seeking God. EnikÅ‘ said, "I read about God in a booklet I received. It's Luke, that's part of the Bible right?" DezsÅ‘ said, "Yes, and there are many other parts of the Bible, I can give you a Bible if you would like one." DezsÅ‘ told me that she may come to next weeks study. 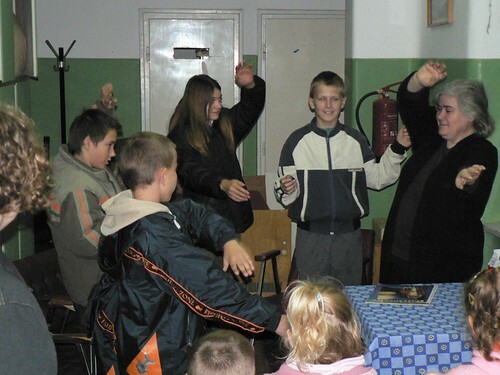 EnikÅ‘ has allowed her son to go to our English camp for the past two years, and she knows our love for God's word. Please pray that she would be drawn into the study, that she would hear truth from God's word and understand it. 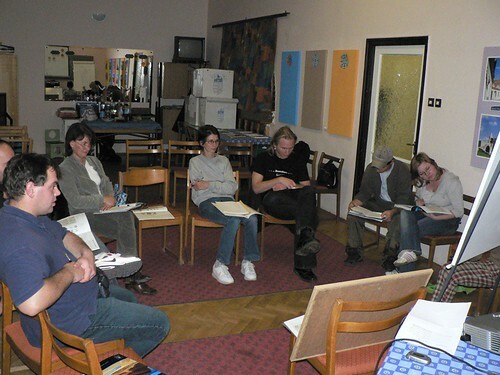 Above: Brenda's intermediate class. Monika and Eszter (Brenda's students) were able to stay for tonight's Bible study, taking up Brenda's offer to drive them home. Please pray that what we have learned so far from Jesus would settle into their minds and hearts. Please pray that God would draw them to Himself and give the understanding of the gospel. Above: The many cute faces of Kira! Above: The A.R.T. (Pioneers Area Resource Team) blessed us today by leading a time of focused prayer and worship for our team. Above: It was refreshing to have a focused time of prayer for the various church planting works in our area, and for those on our team who are on the front lines. We were thankful for the A.R.T. team building us up and stirring us on through encouragement. 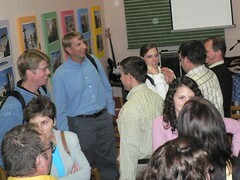 It is our hope that other church planting teams from our target area will join us next month when the A.R.T. team joins us again. Above: Front line men: Csaba, DezsÅ‘, and Miki. 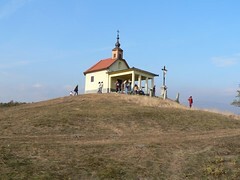 On Saturday, Miki (with DezsÅ‘ and Csaba's help) began their first evangelistic Bible study in the neighboring town of Selyp. Miki serves as a mentor of these two men, and it is great that they experience "hands on" church planting work as they are being mentored by Miki. 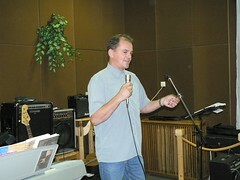 DezsÅ‘ also shared about what God is doing at his workplace. He said that he was confused initially after being saved as to how he would serve the Lord. He works practically all day and doesn't have much time outside of work. He now realizes that God has him exactly where he wants him–his workplace is a field ready to be harvested. 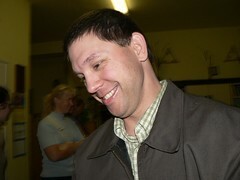 DezsÅ‘ has already led three people to Christ at his work place over the last three months. He says that there are nine more that are constantly asking him questions and searching. 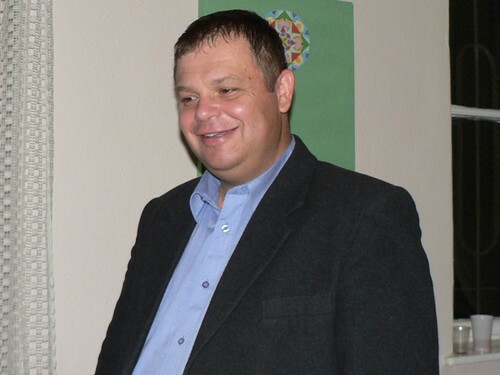 Please pray for DezsÅ‘, as he returns to work tomorrow, as an ambassador of Jesus Christ. Above: Csaba (with Heidi translating to English for our guests). 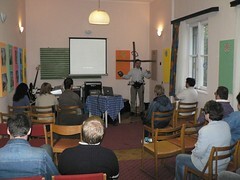 Csaba gave a report of the spiritual 'climate' of Selyp and specific barriers that we prayed about. For example, in this small town there are three palm/tarrot card readers. 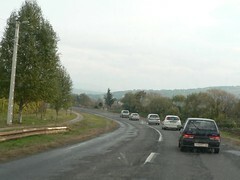 Some even commute from Budapest to see them. There are also some in authority over the town who declare the Baptist church a joke (sometimes even a sect). We trust that God will make a way for the Gospel of His Son to saturate Selyp. We can only hope in God's power and authority to give us this opportunity for His glory. The other night, while our family was enjoying dessert at our local ice-cream shop, Gabi K. approached us on his bike. He asked, "Should I bring my Bible on Thursday night?" I had invited Gabi K. to our study at last weeks sport's outreach. I am thankful for God working on his heart and motivating him to attend. Thank all of you who have prayed for Him! Above L to R: Dávid, Gabi K, Zoli (hunched), and Gabi S. Our Thursday night study dealt with everyday decisions that teenagers have to make in life. I was thankful for the openness of the teenagers to share what is going on in their lives, and the way we seek to encourage and support each other in prayer. It is our custom to stand in a large circular embrace as we pray for each other. It was clear to me through Gabi K's prayers and participation in our discussion that he reads God's word at home and has an understanding of the gospel. Please pray for these four men to grow in maturity in Christ gaining a full understanding of God's love and His calling for them personally. Above: In place of our Friday sports outreach, we held our once-a-month game night at Miki's house. Just a few teens showed up, but we had a good time getting to know each other more. Miki had the teens discuss an abstract drawing that represented a life of sin, it's consequences, and a life in Christ and it's benefits. After the discussion, he brought in God's word and had them read the gospel message. Tomorrow, Miki will take a first step in a new branch of our team's desire to church plant in the towns of Selyp and LÅ‘rinci. He will be holding an evangelistic Bible study. 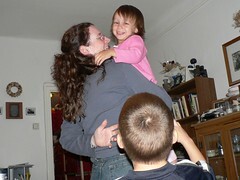 Anita (who served with us in our VBS from Selyp) has invited some friends and families. Please pray for this new step of outreach in Selyp and LÅ‘rinci. 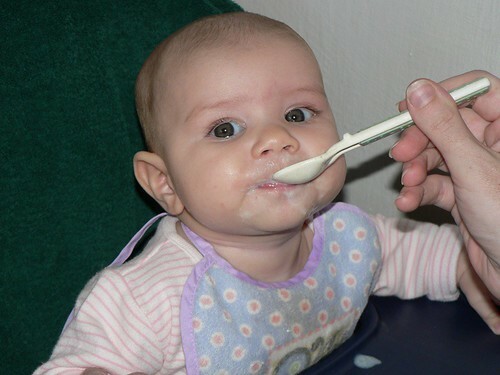 Above: Kira is beginning her transition to solid food. She was more than happy about that! Above L: In a race between Ben and Kira to see who's two bottom teeth will come in first, Ben yanks out his second baby tooth to make room. 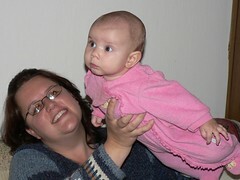 Above R: Sharon having some fun tossing around Elianna. 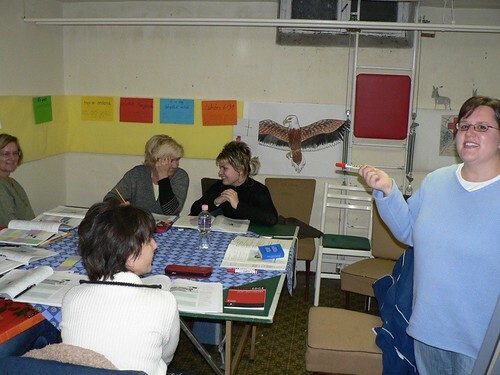 Above: Heidi stepping out of her comfort zone and teaching her first english class in PetÅ‘fibánya. She is teaching the beginner class (one of our biggest). 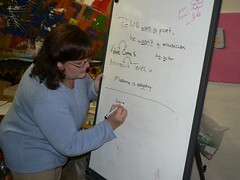 Above: Although Brenda was able to team teach last year with Val, this is her first time teaching on her own. She decided to teach Val's class, expecting the same students to return this semester. Last Monday, it turned out that she had a whole new group of students register that she had never met. So much for 'easy'. I am thankful for Heidi and Brenda stepping out in faith, seeking to bless these students through our ministry. Above: Allen's class. I had a great time teaching tonight, and reconnecting with returning students. I am thankful for new students, Szandi (middle long hair), and Hajni (far right) who already seem comfortable with the others. God has created a great atmosphere of friendship in this group. We praise God for many students who stayed for our 'free' second hour of English, where we study the claims of Jesus Christ. Tonight, we discussed the idea of satisfaction. Our Bible text was taken from John 4 (Samaritan woman) and Ecclesiastes. I was thankful for the participation of the group in the study. We hope that these studies will lead to a greater understanding of what Jesus taught, and a concrete decision of believing Him for all that He says He is. 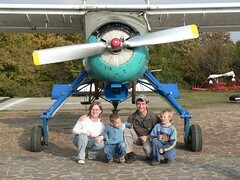 Above: Attila, Hugi and Heidi. I enjoy seeing people staying afterwards rather than rushing out to go home. It shows that this is more about relationships than just English class. Brenda took one of my students, Hedvig home by car and talked about the second hour study. 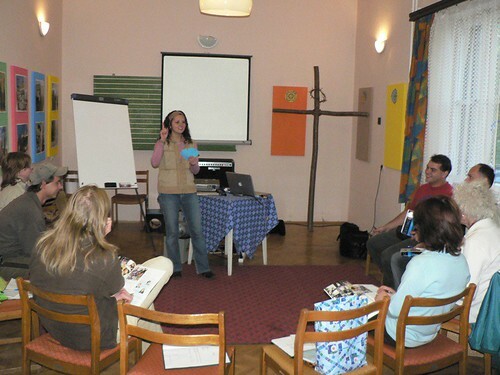 Hedvig said, "I didn't know what one hour would be like talking about the Bible, but it was fantastic!" Before stepping into the second hour study, Hedvig asked DeszÅ‘ what we (the 'Baptists') were like. She wanted to know what the difference was between our church and others. DezsÅ‘ explained that the foundation of our faith is in God's word, and what is taught is relevant living truth. I'm thankful that he was able to further encourage her to come to the second hour, and It now seems that she looks forward to coming again. 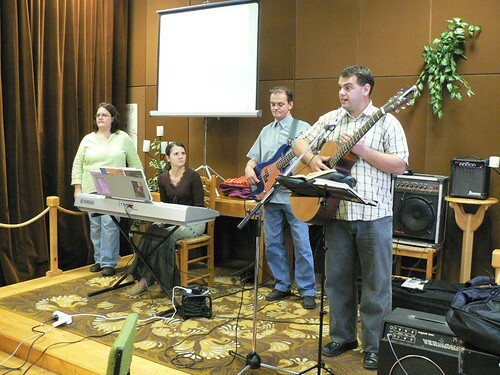 Above: Our musical worship team, Brenda, Heidi, DezsÅ‘ and Miki. Above: Tonight, PetÅ‘fibánya is holding elections for local government in the room we rent for church. 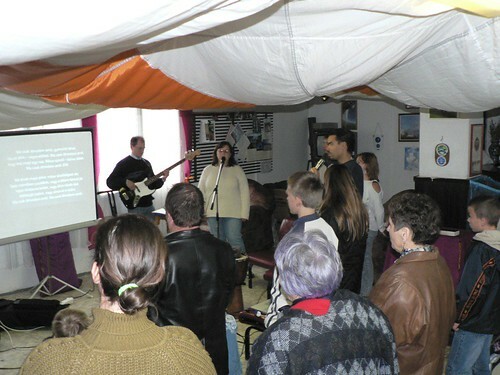 We were thankful that they allowed us to use a larger room in another area of the building. I was thankful for DezsÅ‘, Csaba, Laci and even Gabi S. giving testimony about what God was teaching them through the week. 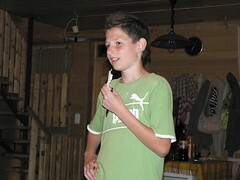 I was especially proud of Gabi as he shared the change of heart he had when serving in the orphanage on Thursday. DezsÅ‘ is a manager of a team of workers who are responsible for producing motors for machines such as dryers or washers. Over the last few weeks, God has opened up continuous opportunity for him to witness at his workplace. 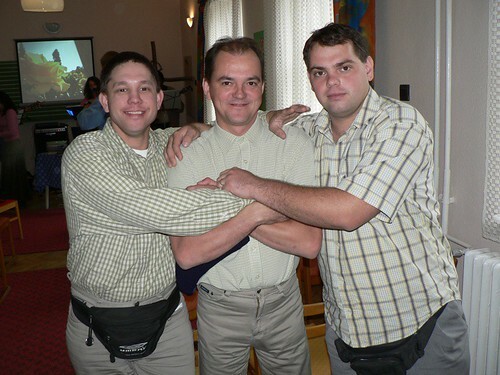 DezsÅ‘ was full of praise to God, as two of his work mates were saved through sharing the gospel. Unfortunately, these two people live some distance from PetÅ‘fibánya and it would be difficult for them to attend our church (we still hope they will visit). Please pray for Erika and József, that DezsÅ‘ would have opportunity to disciple them, and that they would grow in their faith. DezsÅ‘ told me that a third workmate, Péter is very close to making a decision to trust in Jesus. Péter has come to realize that he is stuck in sin, and his lifestyle is empty of true blessing in the heart. Péter said to DezsÅ‘, "Now that I know these things, maybe it would have been better that I never found out the truth." Please pray that Péter will respond to his conviction of sin and find the forgiveness, and love that God offers through a new life in Jesus Christ. Above: Miki escaping after (most likely) playing a practical joke on DezsÅ‘. Above: Tonight's service was a combination of preaching and small group prayer and discussion. 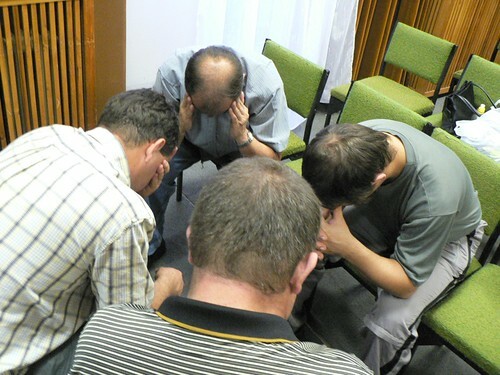 I was encouraged to see members praying for one another. Tonight we focused our discussion on what it means to love as Jesus loved. 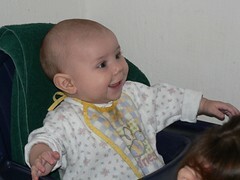 Above: Elianna totally entertained with her balloon after the service. 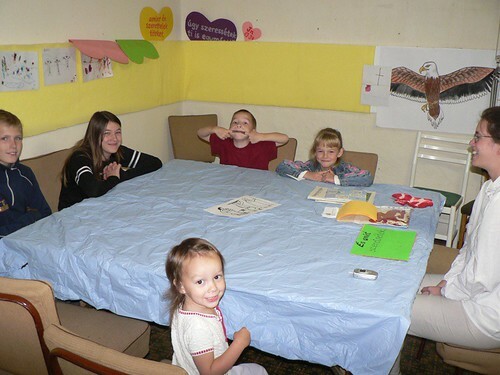 We are thankful for Janka serving as our children's Sunday school teacher and coordinator. We have a core group of kids that attend weekly (including ours of course) who continue to be blessed by her teaching of God's word. 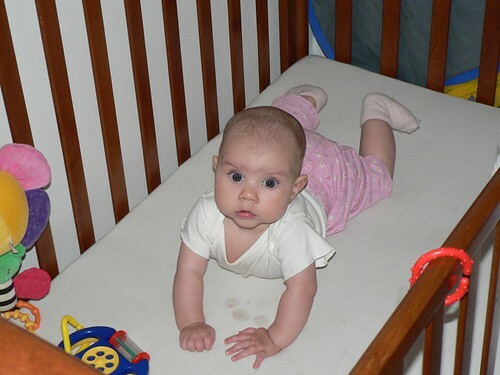 Above: Super Kira lifting her head high. 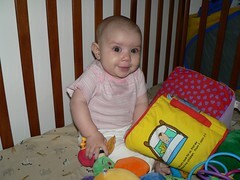 Above L: Kira learning to sit up by herself. 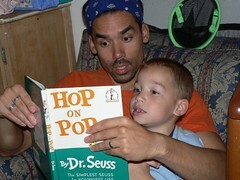 Above R: Allen teaching Ben how to read an old-time favorite "Hop on Pop". Ben did a great job and read his first three (three word) sentences while Elianna sang her ABC's in the background.